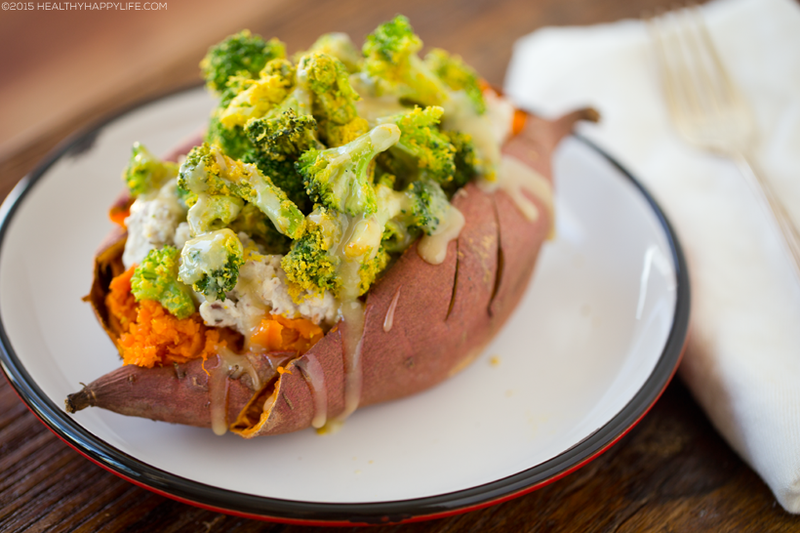 This is a one potato meal that you need to make! These are amazing. 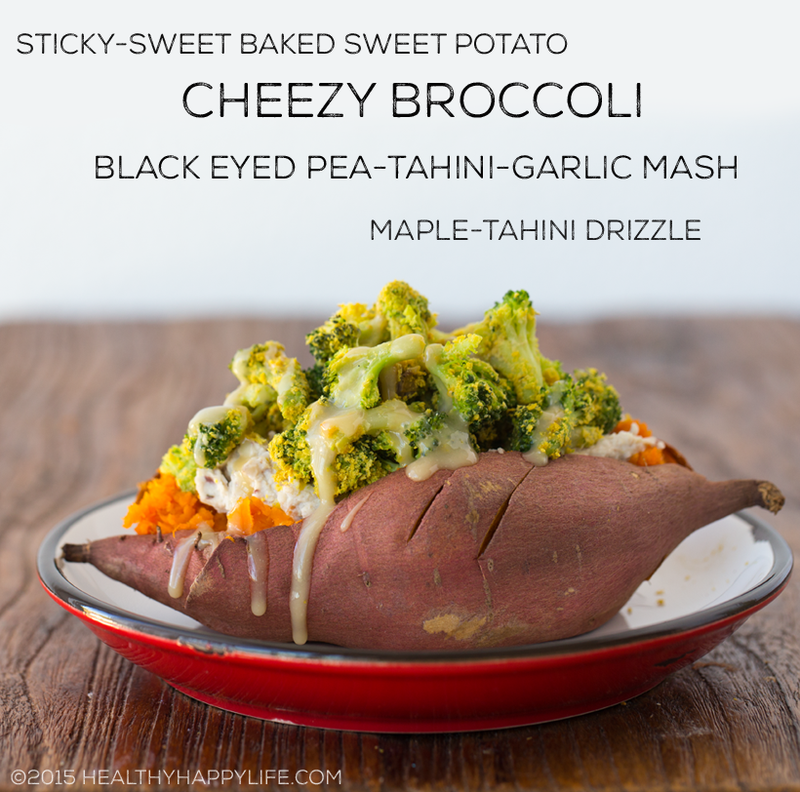 I hope you try my Cheezy Broccoli Stuffed Sweet Potatoes with a black eyed pea-tahini mash, and tahini-maple drizzle on top. Salsa optional. Get the vegan recipe.. It starts with this. 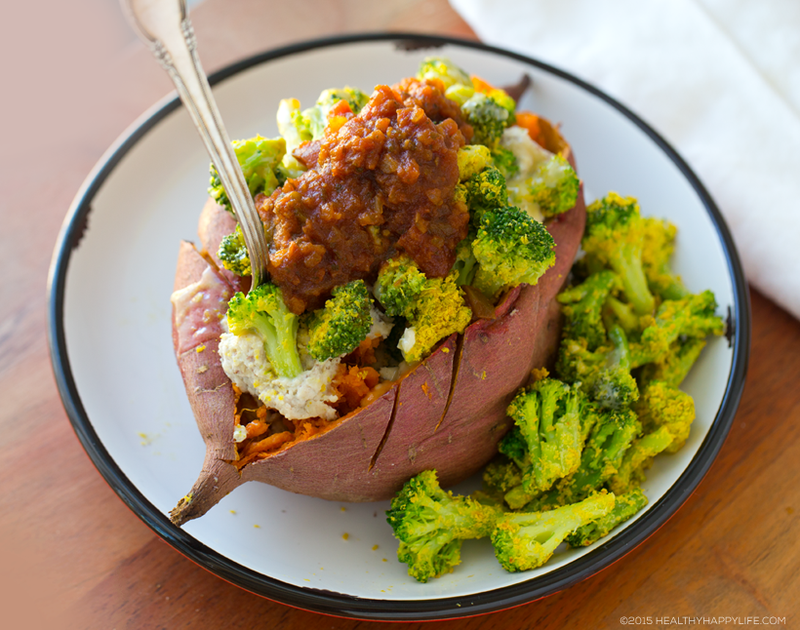 A perfect sticky sweet sweet potato. Salsa on top? Go for it.. 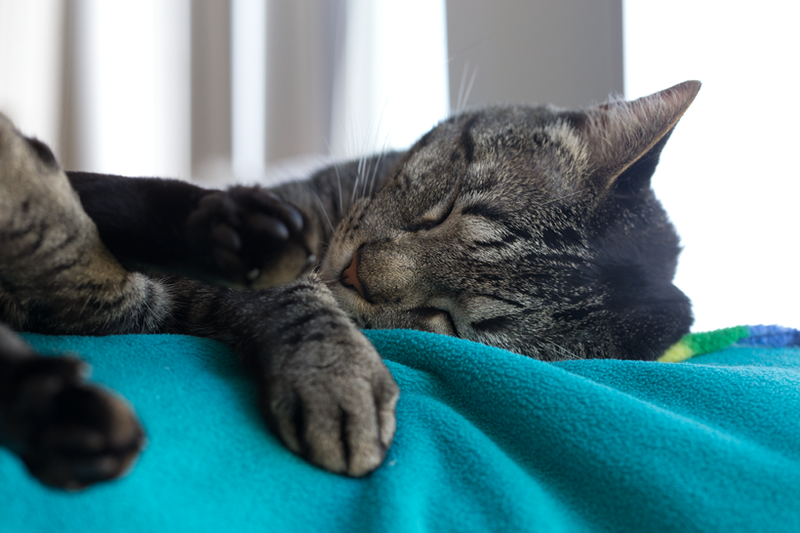 I should have been running errands. Not cooking up and photoshooting more recipes for the blog, since I have a queue a mile long. I made them around 4pm today and just HAD to eat them as an extra early dinner feast. 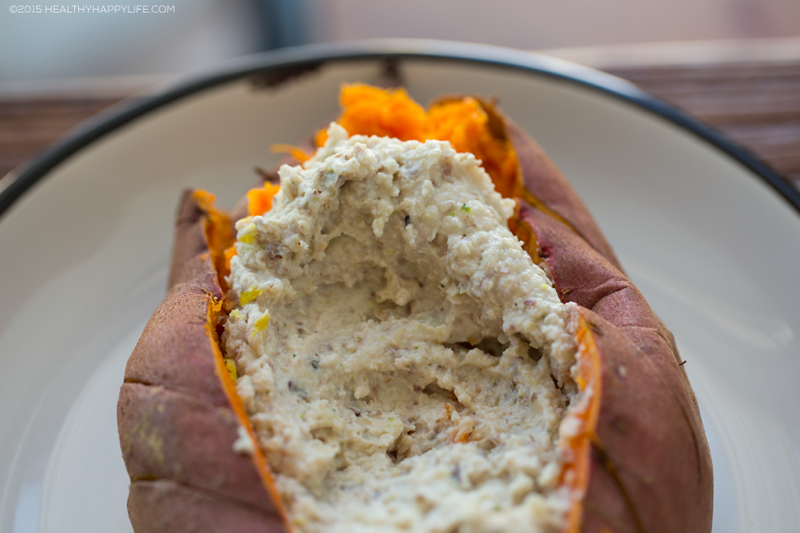 They are so filling, soothing, nurturing, healthy, delicious and just plain rad. I really hope you try them! 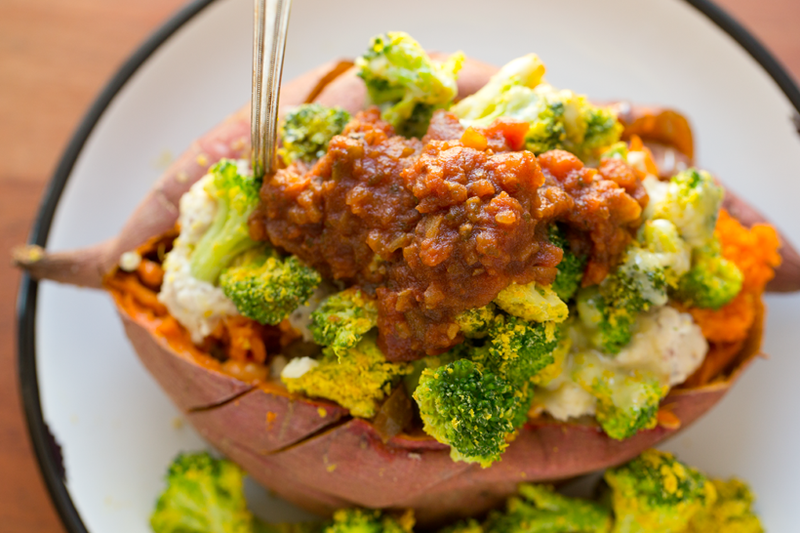 Sweet potatoes offer up flavor, fiber and loads of vitamin A and potassium. Black eyed peas offer up fiber, iron and protein. 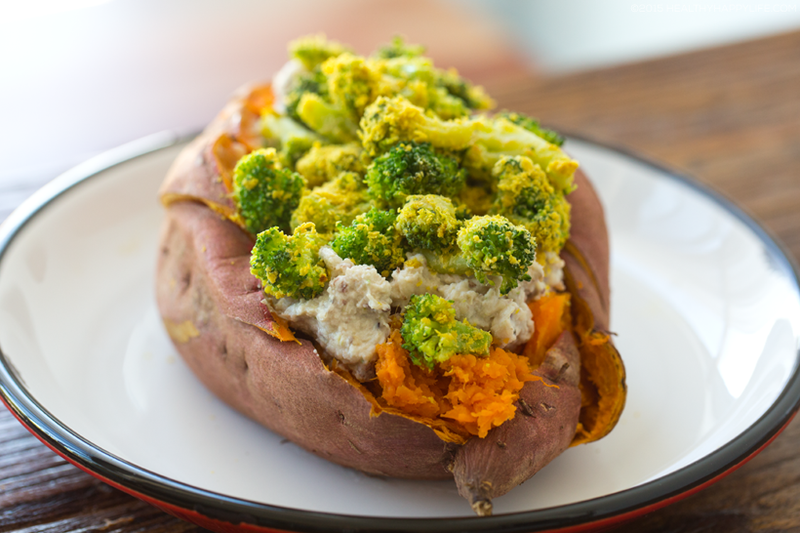 Broccoli is a veggie you want to be eating more of because of its antioxidants and possible anti-cancer benefits. 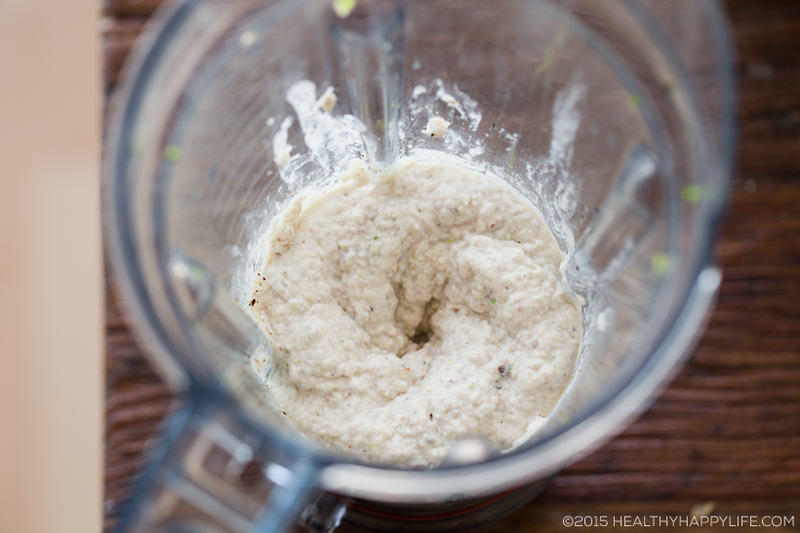 Tahini offers flavor and healthy fats. 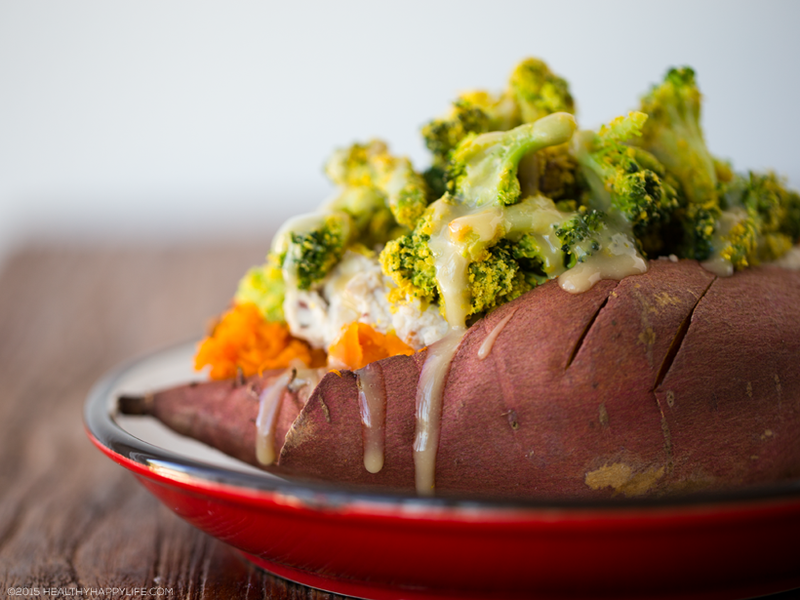 Nutritional yeast adds essential amino acids and B-vitamins. Garlic is a healthy super ingredient with so many benefits including an immune system and healthy heart boost. And optional salsa adds even more flavor and veggie goodness. 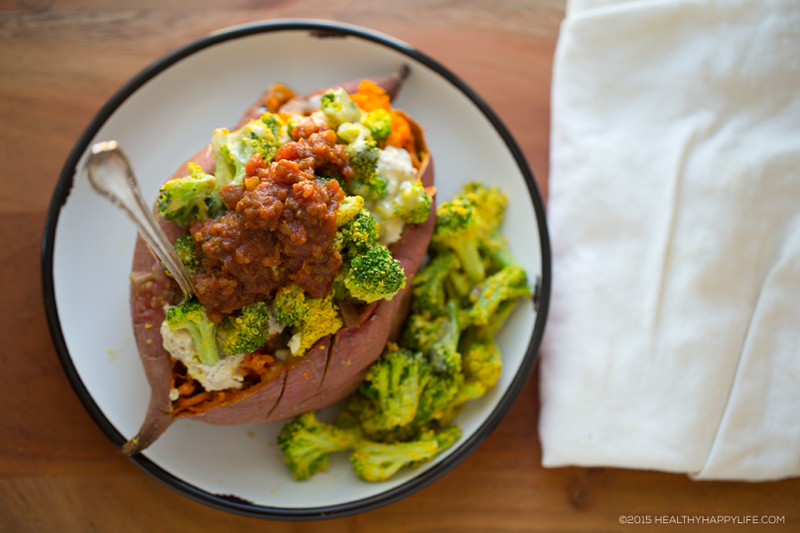 Have a stuffed sweet potato meal this week! 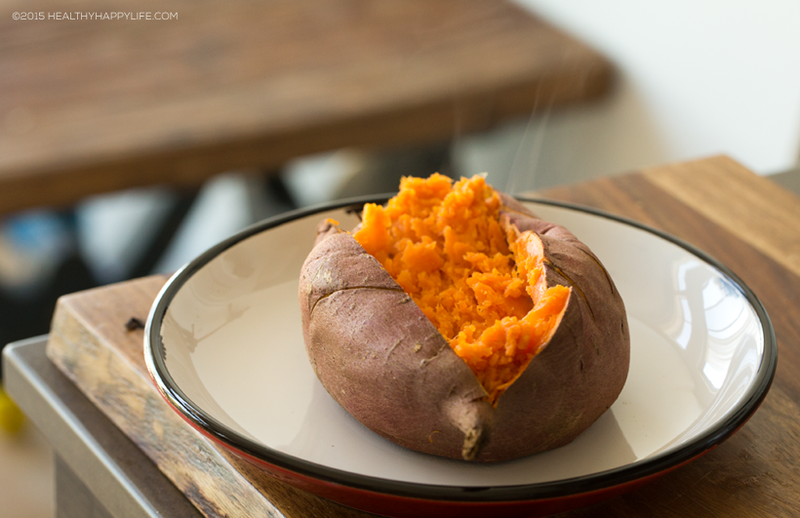 Fun fact, kittens love when sweet potatoes are cooking. 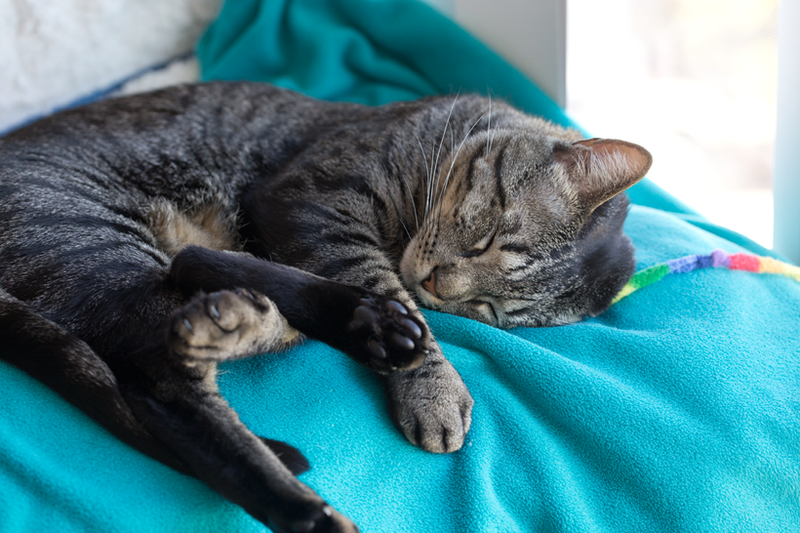 The house gets all warm and sweet smelling so they can sleep all day. Oh wait. Maybe they do that anyways..
with salsa, if you'd like.. This is a one potato meal! 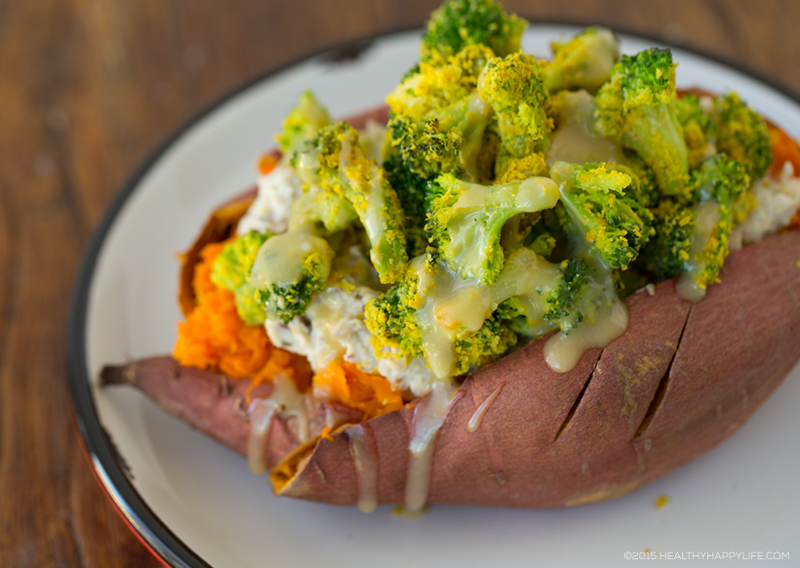 Each sweet potato is stuffed with a tahini bean hummus and overflowing with cheezy skillet broccoli. Healthy meal! Warm oven to 400 degrees. Poke fork holes in the sweet potato. Bake for 30-60 minutes, or until tender and sticky sweet. While potato bakes, prepare the fillings. Bean smash: Heat the black eyed peas by boiling them for 5 minutes. 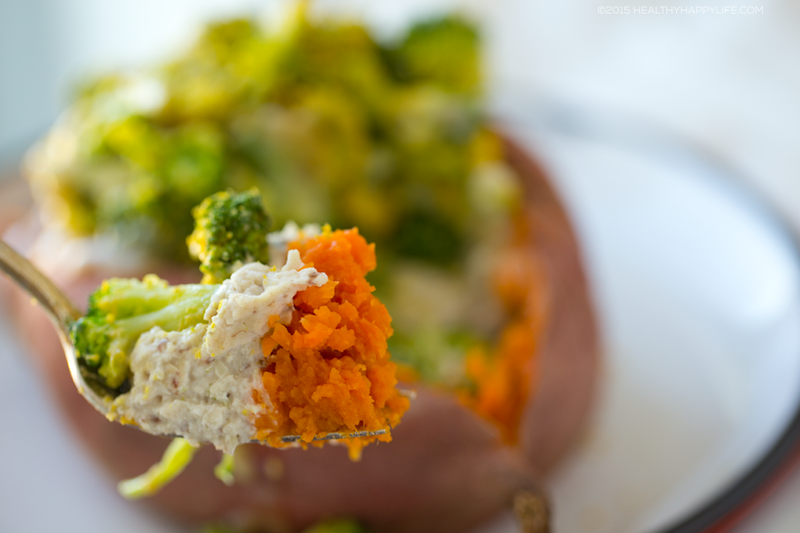 Drain water and add peas to blender along with garlic, tahini, lemon juice and non-dairy milk as needed. Blend until smooth, yet still slightly textured. Add salt and pepper to taste. Spoon out into small bowl. Steam or lightly boil broccoli until tender. Drain and add to a skillet over high heat. 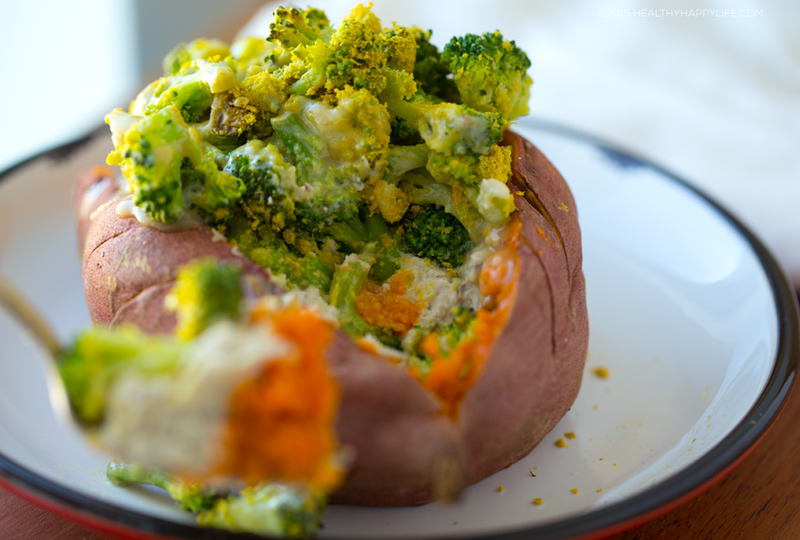 Sprinkle nutritional yeast over top and fold a bit. Cook for 4-5 minutes, tossing broccoli with a spatula ever minute or so. 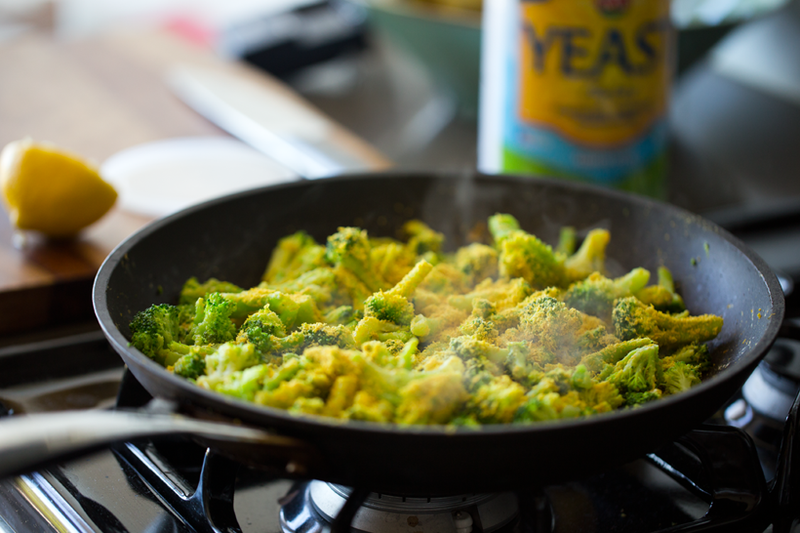 You want to heat the broccoli just enough so that the excess water dries out a bit and the nutritional yeast marinates into the broccoli. 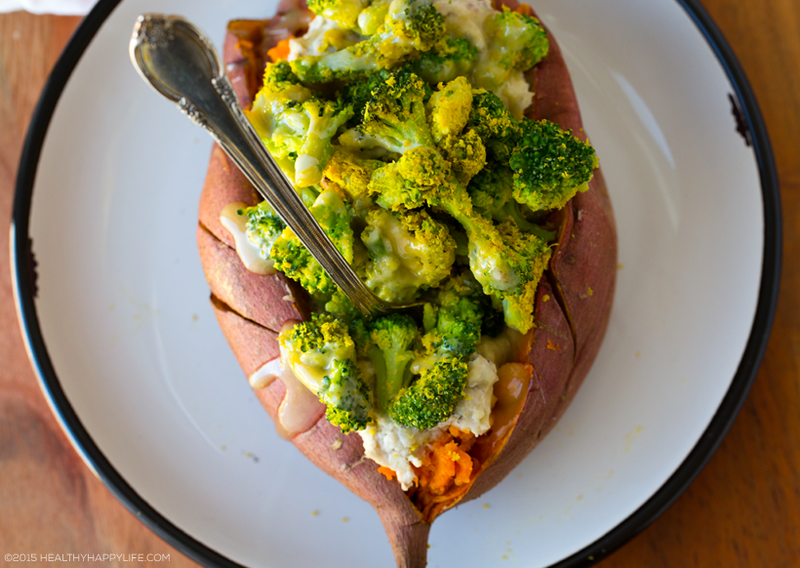 (You could also roast broccoli with a splash of EVOO.) 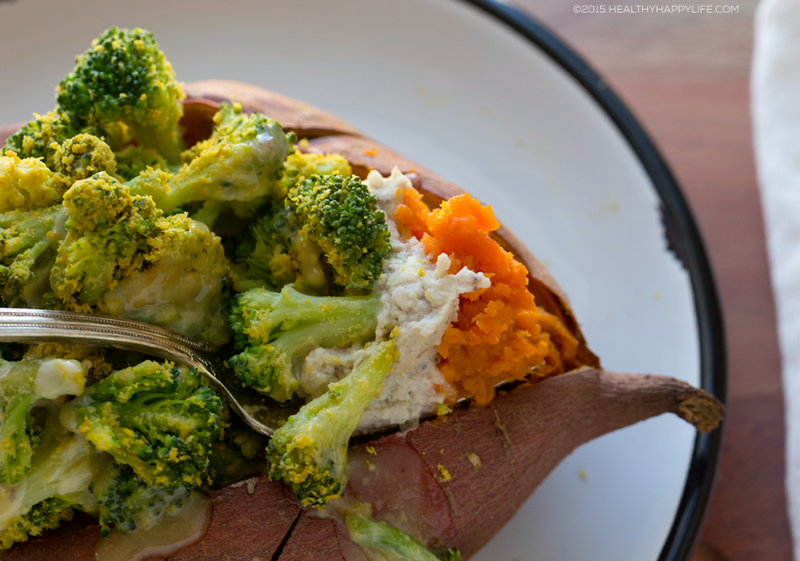 Set broccoli aside when ready. 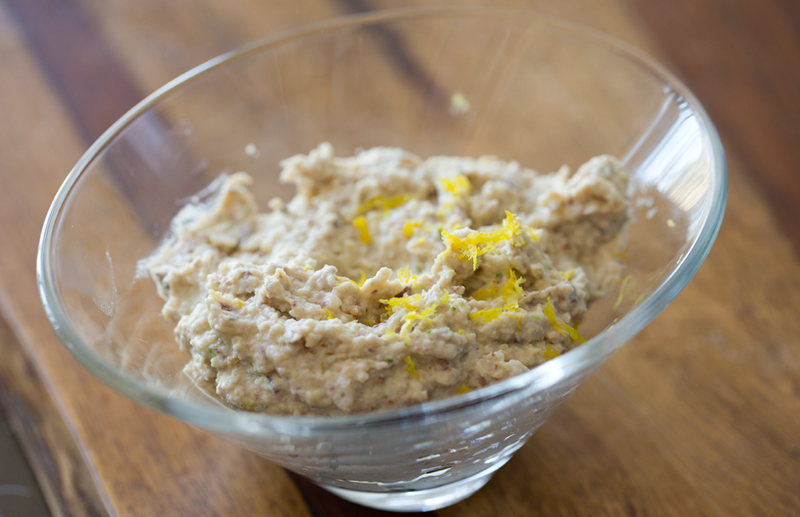 Whisk together the maple and tahini for the drizzle. Stir until silky smooth. Stuff your potato! Slice potato down the middle. Add a small drizzle of maple syrup (optional) and mash the sides of the potato to fluff and soften. Mash the filling down to make a nice hole for the filling to sit in. Next, spoon in 1/2 cup of the bean mash and flatten down, spreading evenly over inside of potato. 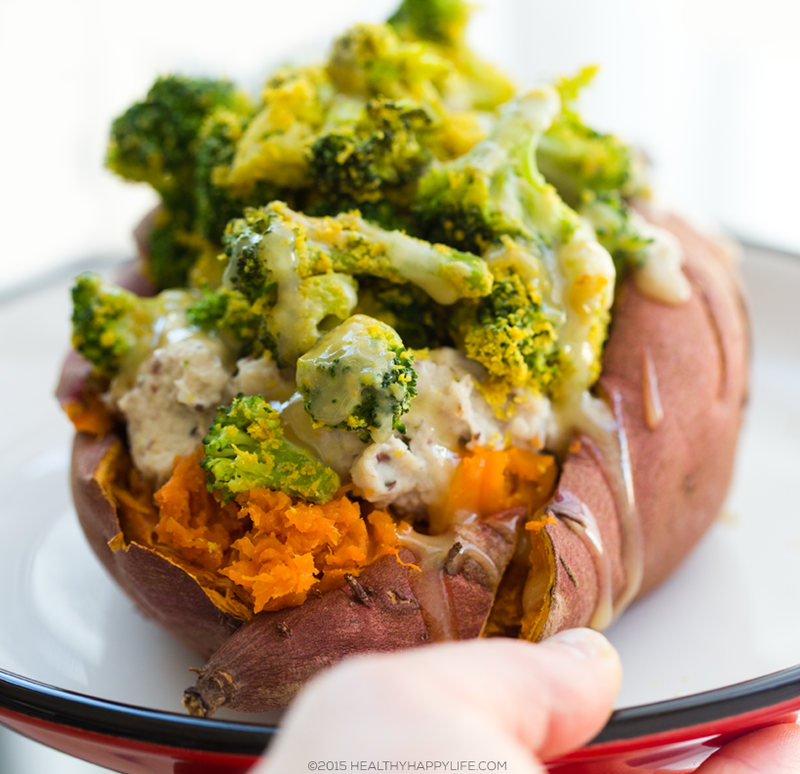 Finally, pile in the broccoli and drizzle the tahini-maple drizzle over top. Add optional salsa. 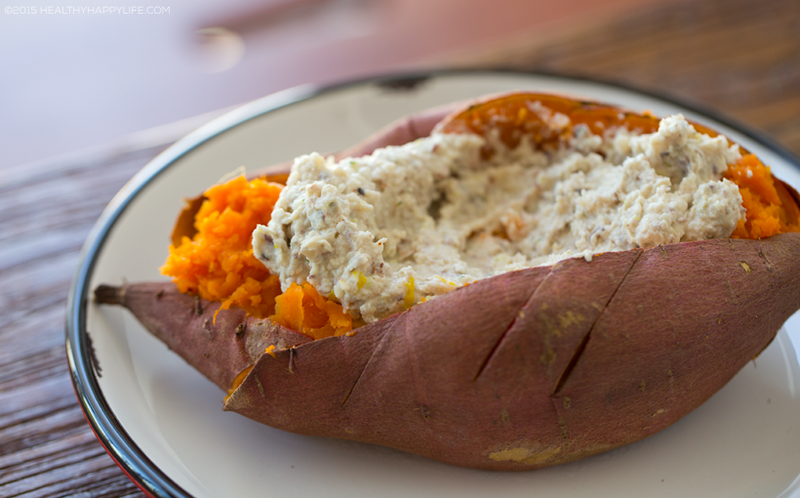 Love stuffed sweet potatoes? 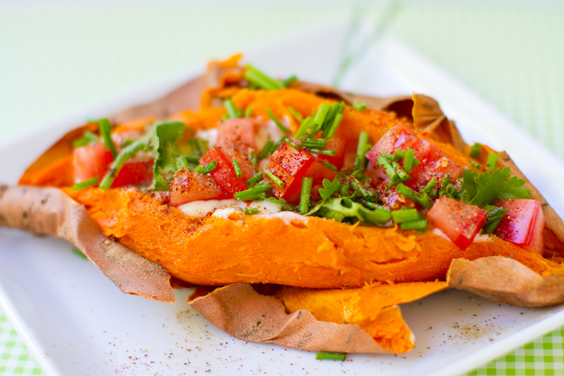 Check out my Over-Stuffed and Simple-Stuffed Sweet Potato recipes..